Miss Granny took me by surprise, and is the first Korean movie I've fully enjoyed since Hello Ghost. There was so much heart and plenty of humor wrapped into the fantastical premise of a woman in her 70s returning to her 20-year-old body. I do feel like the film fell just short of being great, in that there were still plenty of cliches and the story didn't quite push as far as I think it could of on its premise, but the highlights definitely overcame the shortcomings. And while the ending is along the lines of what you'd expect, there was a wonderful cameo / twist that managed to make me laugh and feel satisfied. The body transformation and the promise of laughs is what got me to watch, but where the story really hit the mark was on the more emotional beats. We start out introduced to our cankery grandmother, Oh Mal Soon, who lives with her son and his family. There's a tension between her and the daughter-in-law, and essentially Mal Soon is faced with the likelihood of getting moved out to a nursing home. She comes across a mysterious photo studio, and in the scene that broke my heart, tells the photographer she should at least look good and wear makeup for her funeral photo. The rest of the story plays out rather predictably, in that Mal Soon discovers sudden fame in singing and gets in a really odd but cute love triangle with a talent executive (Lee Jin Wook), her grandson (weird, but never squeamish) and her childhood friend / current ahjusshi Mr. Park. My main criticism is that I wish they'd taken a bit more risk in how they treat some of the story lines in this movie. Things like the relationships and family dynamics often felt a bit shallow and almost childishly naive at points. For one, it felt like a major waste of Lee Jin Wook to have him just stand there and look pretty. There was plenty of chemistry, and even an overnight stay involved, yet we got no more than some comical dialogue. Like that's it??? The same could be said for her convenient rise to fame, which seemingly just landed on her lap. Most movies require some suspension of disbelief, but I would have almost rather settled for something more believable and less flashy. Our protagonist is the loud and opinionated Oh Mal Soon, played mainly by Shim Eun Kyung. While I liked her, I found her performance excessive and exaggerated at times. It helps me understand some of the criticism of her Nodame performance (which I haven't seen yet), because she seems to purposely play up the doofusness of characters. It somewhat makes sense since she's built up her reputation around comedy and crass humor, but I wish it'd been more balanced. She does have one great emotional scene with her "son," but that felt too short and abbreviated in the context of what could have been portrayed. Our main love interest here is played by Lee Jin Wook. As mentioned, Lee Jin Wook is just on a roll with me, and his character managed to make me care and sigh even with the very limited screentime and dialogue he received. A few years ago I featured him in my Stars Whose Appeal I Don't Understand post, but I can now confidently say that this guy has managed to completely remove himself from that list through demonstrated acting charisma and offbeat humor. Nine was the turning point for me; while he wasn't all that impressive in the first few episodes, he grew spectacularly as the show wore on. This was affirmed by Three Musketeers, a show I never quite liked due to the slow pace and political machinations, but he was easily the best part of it with his hilarious yet grounded Prince. His producer role here is more trophy-pretty than substance, but he rocks it and you can easily see why even an inner-granny could fall in love with him. I just wish they'd built more on the relationship between him and Mal Soon. Finally, there's the old friend, Mr. Park, who's truly a standout. He's a mix of pitiable and hilarious, and the veteran actor who plays him really sold the role to me (and that ending!) He's the guy who's crushed on Mal Soon his entire life despite her repeated rebuffs and insults, and his continual loyalty and respect for her are just so endearing to watch. My favorite moment is probably his attempt to exercise and "turn young" again, which was both so sweet and sad. The other characters really didn't get enough time for me to make a formative opinion. Young grandson was super cute in his puppy love for grandma, while Dad rose to the occasion with a sorrowful scene at the end. This was a strong cast of characters overall which sold the ridiculous premise to me. I'm really excited to see the C-drama interpretation, which from the trailers will hopefully feature a less shrill Mal Soon. If you haven't watched this yet, be sure to skip over this section because I will discuss spoilers, including the great ending scene (seriously, this is much better as a surprise, so go watch the movie first). I think all of us knew she wouldn't be able to stay in her young body, no matter how much we might have rooted for the Lee Jin Wook ship. I'm disappointed that we didn't even get a full kiss, although I can understand why they didn't include that for the sake of squeamishness on the theoretical age gap and maintenance of the sense of innocent love. But the forced execution of this end result was probably my biggest disappointment with the film. Of all things, her grandson has to get hit by a truck and require a blood transfusion that only she can provide? It feels like the writer didn't even try to write something original, and honestly that dampened my respect for the story as a whole. I did like the character dynamics, including her heartfelt confession with her son, but I wish we'd gotten more depth out of them. After all, this is the first and only time she speaks with her son upon the transition, and while it managed to make me tear up, it also just barely skimmed the full dimension of their relationship. Similarly, I'd hoped for more between her and her daughter-in-law, and while I was happy to see them reconciled at the end, I felt like there was quite a leap required to get there, which was completely glossed over by the story. Lastly, Mr. Park. Oh Mr. Park, the eternally Mal Soon-obsessed guy who gets shunted over both in the past and present. At least he gets a semi-happy ending with a cameo transformation that was seriously awesome (and well-timed given the popularity of You From Another Star when this aired). The one thing about their relationship was that I saw Mal Soon almost having to settle down with him at the end. It was clear through the whole drama that she'd never once viewed him with romantic interest, apparently not even when he was a young Kim Soo Hyun. But I guess that's for the best, because not all stories need to end with a romantic couple; sometimes the best relationships are between old friends and companions. A cute conclusion, a generally strong story, and solid acting make this an easily recommended watch from me. 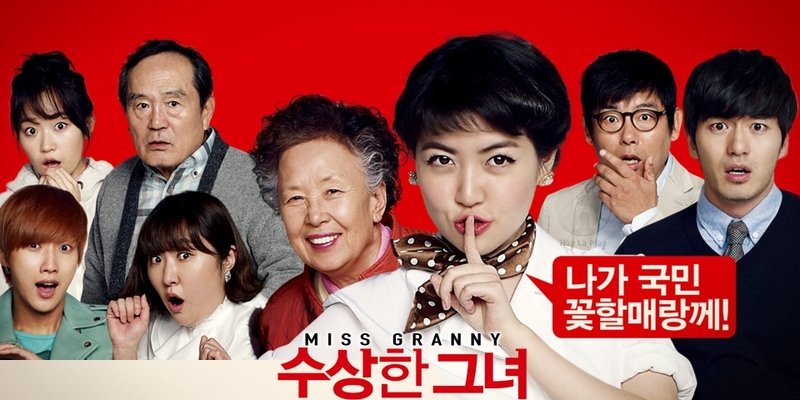 I think if you're looking for some humor and feel-good moments with a touch of romance, Miss Granny is just the right mix, especially if you're seeking something to watch with the family over the holidays. In round it rather predictable on the level of a hallmark or ABC family cable movie. It is very 80s Hollywood movie. Good comparison, this definitely isn't the most original in terms of story or execution. My expectations for Korean movies are extremely low though, and this one was at least enjoyable so I give it some kudos. Shim Eun-kyung's performance in Miss Granny was cited as one of the key reasons why she'd be perfect as Naeil (k-Nodame). I haven't seen this film, but I did watch a few episodes of Trainwreck Cantabile and it was beyond stupid. Shim's acting in the first few episodes was awful and more in line with the retarded school buffoon than Nodame, and some netizens thought it could be the director's fault. Not sure if it's a similar director issue here or if the role called for it? Anyway, I thought she was passable in quieter beats, but her co-star and story let her down.